﻿ Best Price on Hotel Playa Santa Teresa in Santa Teresa + Reviews! Located just 230 feet from Playa Carmen Beach, Hotel Playa Santa Teresa has an outdoor pool, sun terraces and a seasonal snack bar. Surfing lessons can be arranged on site. The modern decorated rooms offer air conditioning and a flat-screen cable TV. They also feature a some rooms have sea or garden views. Bathrooms come with a shower, and free toiletries. Free Wi-Fi connection is also available. Playa Carmen and the surrounding area are a playground of activities, offering ATV tours, surfing, snorkeling, yoga fishing, horseback riding on the beach and mountain biking. The staff can help you organize tours and activities at any time during your stay such as canopy tours and visits to nearby waterfalls and Tortuga Island. 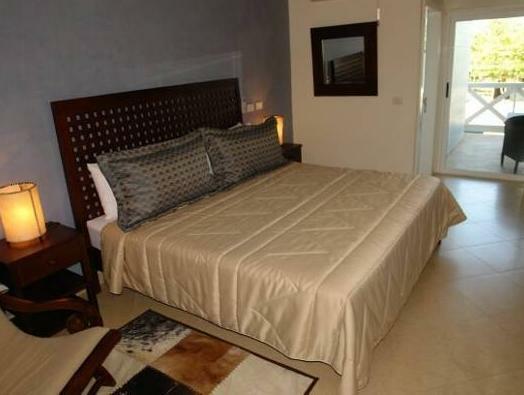 Hotel Playa Santa Teresa guests is centrally located close to banks, pharmacies and restaurants. There is a bakery just 164 feet away, while Las Piedras Parrilla Argentina restaurant is 984 feet away. Just 82 feet from Hotel Playa Carmen there is a bus station, and Tambor Airport is 25 mi away. Free public parking is possible on site. Please note that the reception is closed from 22:00 until 07:00. Guests arriving outside reception opening hours are kindly requested to inform the hotel in advance to arrange check-in. Contact details can be found on the booking confirmation. Please note that check-in & check-out after hours has an extra fee. To verify credit card, a precharge for 1 USD may be done. Rates are based on double occupancy. Children under the age of 10 stay for free. (Max. 2 children per room). Breakfast for children between the ages of 5 and 10 has a price of 6 USD. Great staff, the guys in the reception are super friendly and helpful. Breakfast was good, for the size of the hotel ( not too big), the usual, fruits, Gallo pinto, cereal. Rooms where clean however it wouldn’t hurt some maintenance, specially in the bathrooms stained with hard water. Location is great, close to the beach, supermarket, restaurants and bus stop.